We are putting forth a broad range of Manual TTR Slitter Machines, as we are assembling, exporter and supplier of this extent. These are accessible with rapid duplex slitter and rewinder with coasting loosens up stand, loosen up strain control framework, autonomous force unit, and so forth. Created by our talented experts as per universal measures, our machines are recognized for their rust and consumption resistance, high toughness, low upkeep and more working life. 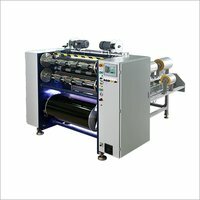 A rapid duplex slitter and rewinder with coasting loosen up stand, loosen up pressure control framework, autonomous draw unit. Each of Top and Bottom slitting shafts alongside move arrangement of 3 rolls. Manual TTR Slitter, AC Motor Digital Drive System alongside loosen up pressure control framework, trim gathering course of action. Velocity up to 450 mtr/min.